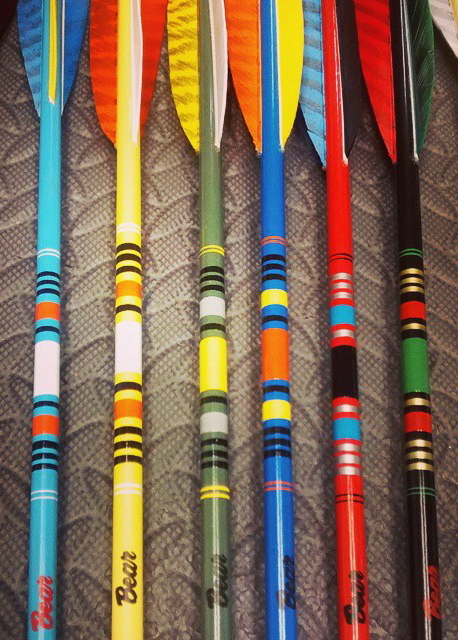 The Bear “Grizz” arrows are here to honor Mr. Fred Bear and his hunting dangerous game with POC arrows all over the world. 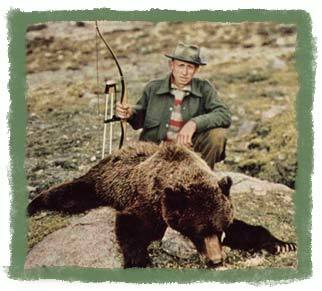 Fred killed more than a few Alaskan Grizzly Bears with POC arrow shafts and the Bear Razor Broad Head point. Along the way he owned and arrow company just down the road from RCA, INC. in Myrtle Point, Oregon and he designed specially coated and painted arrows for himself and his customers. 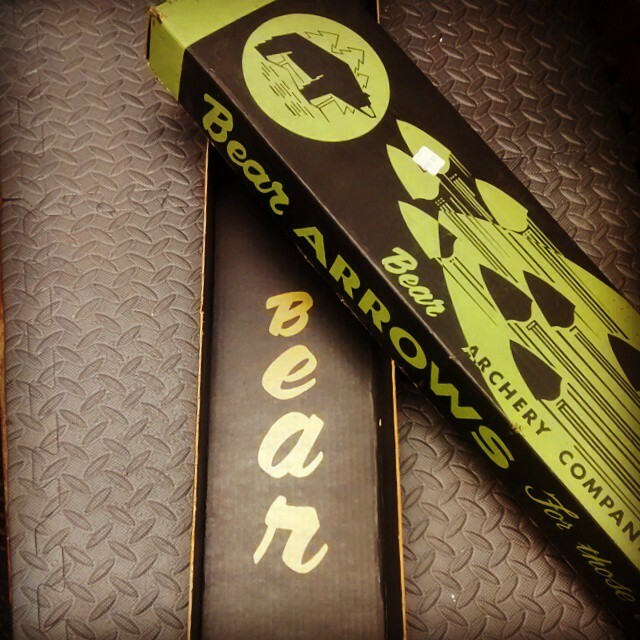 So Rose City along with Bear Archery have decided to bring back the exact design and colors of arrows Mr. Bear used in his hunts and travels. We are proud to introduce the Models 200 Grizz and the 300 Grizz. 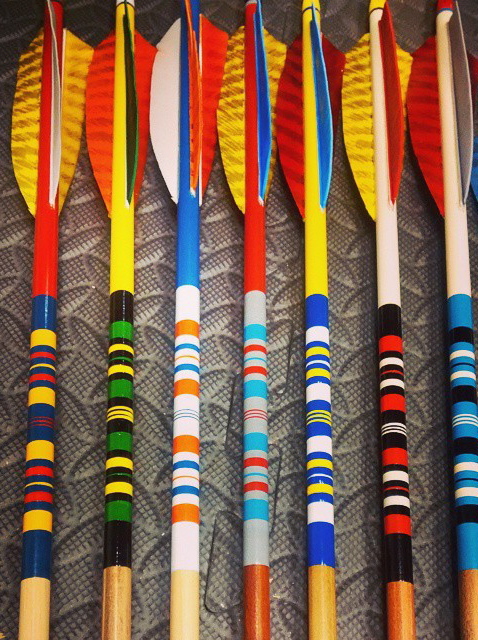 These arrows have all of the same paint and cresting colors that were used by Mr. Bear in the 1950’s and early 60”s. Of course they are Premium Port Orford cedar shafting and barred turkey feathers. As you can see from the pictures the cresting is extensive and the workmanship is incredible, looks like it was done with a machine, but my little arrow elves do it all by hand and they are perfect, multiple colors and gorgeous metallic highlights. We are introducing a couple of new crown dip colors that were very popular “back in the day”, green and black. 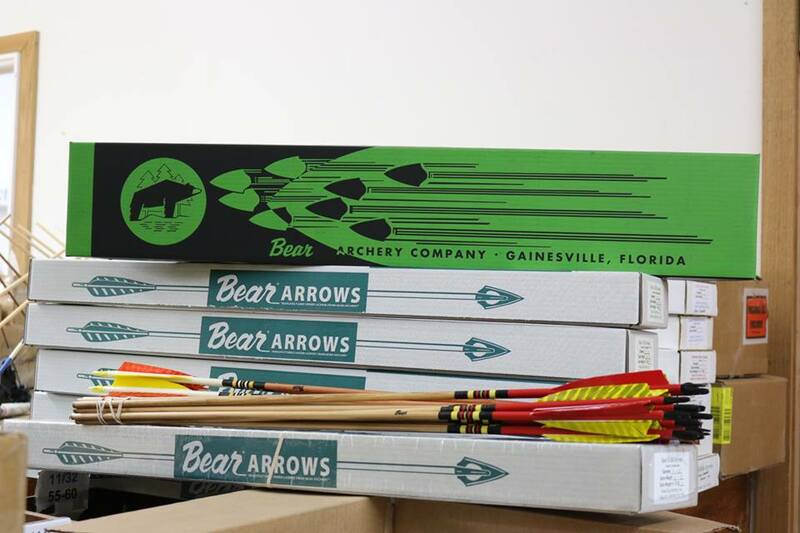 One of the things that got every one’s attention when we started this return to the past with Bear Archery was that we brought back the same boxes that were used at that time that had become collector items over the years and guess what? We did it again. Another collector item with every box of arrows, as with the last box we reintroduced you will have your choice of which classic box you want with each dozen arrows of the “Grizz” arrows or “The Polar Express” arrows you buy. What’s the Polar Express? That’s the arrow Mr. Bear used in his Polar Bear hunts in the 50’s and 60’s. This arrow is fully dipped special cream color Port Orford cedar shaft to match the snow color on the North Slope with special cresting exactly as it was on Mr. Bear’s arrows. That along with barred feathers to match and you’re ready to go. You place the order, you pick the colors, the feathers and we’ll do the rest. The “Grizz” and the “Polar Express” will come with a dozen field points (@125grains) included in the price and will be packaged to insure your new box of arrows gets to you as they left here, undamaged. For a small additional charge we can cut to your specified draw length and install the points for you so that the minute you open the box, you can start shooting. 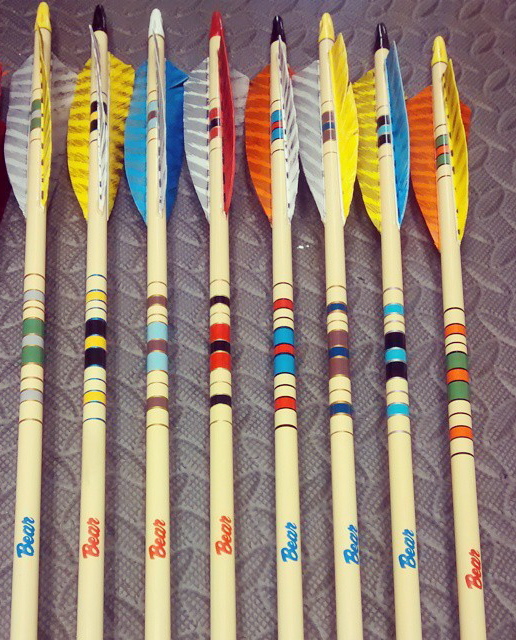 To Order these new arrows call the Rose City office at (541) 572-6408. This entry was posted in Arrows, Bear Archery, Port Orford Cedar Arrows and tagged archery, archery hunting, arrow making, Bear Arrows, bow hunting, cedar arrows, Port Orford Cedar, traditional archery, traditional archery hunting on December 15, 2014 by rosecityarchery.